Molalla girls' split the most recent outings against Gladstone and North Marion in the tail end of its season. Against the Gladstone Gladiators they got a solid win 49-42 on Tuesday, Jan. 29. The team stumbled in the next meeting against North Marion on Friday, Feb. 1, losing 66-36. Against Gladstone, Molalla fell behind at the end of the first half 24-19. The team turned it around in the second half though, outscoring the Gladiators 11-10 in the third quarter, and 19-8 in the final frame. Part of the reason for the turnaround was good rebounding and steals. "We turned the ball over too much with unforced turnovers trying to make something out of nothing too often," Molalla head coach Phil Wiesner said of the team's performance. "The girls balanced that though with a great game on the boards and 13 steals to give themselves many extra possessions. Gladstone plays a very physical game and it was good to see us battle back from a deficit against that physicality." 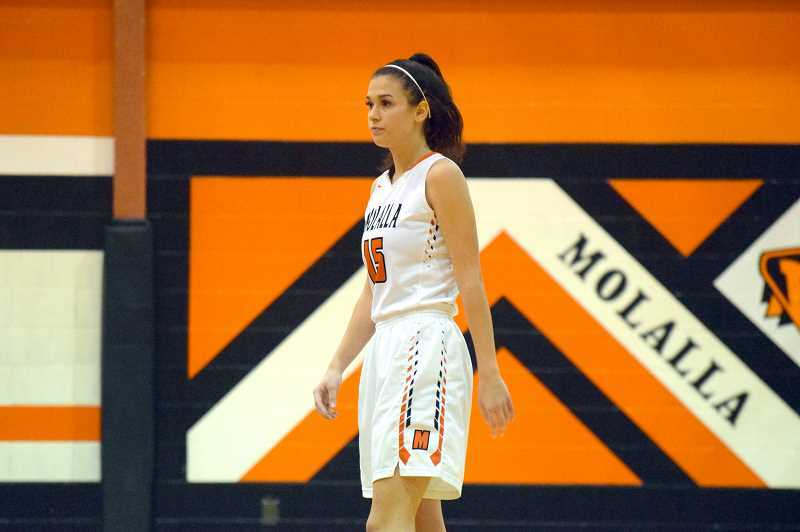 Particularly impressive performances for Molalla's team included senior Mattie Myers who had 17 points, 15 rebounds, 5 assists, and 5 steals. Sophomore Kaityn Curry had 9 points, 8 rebounds, 2 assists, 2 steals, and 1 block, and junior Madeline Lisac had 8 points and 5 rebounds. In the follow up game against North Marion, Molalla came up short by 30 points in the rematch. Molalla was outscored in the first three quarters, and tied the Huskies 13-13 in the final quarter. The third quarter was particularly difficult for Molalla, who were outscored 22-5. "We competed well with them when they were here but we just didn't come out ready to play against them," Wiesner said. "North Marion didn't have a particularly good first quarter but we couldn't take advantage, shooting ourselves in the foot too often. That is something we have to be able to overcome. We're working on it but obviously we're not there yet. It's on me to help us find a way past that against the really good teams, which North Marion is." One of the bright spots on the night came from Lisac, who battled to the charity stripe and went 13-of-15. The team shot from the free throw line 29 times, and made 20, but only made eight shots from the field. Molalla (3-3 in the Tri-Valley Conference, 11-9 overall) will have a chance to redeem itself against Estacada (1-5 in the TVC, 3-17 overall) on Friday, Feb. 8. Molalla won the first game in the series 56-34 on Friday, Jan. 18.